Lovers + Friends dress (c/o). Vanessa Mooney necklace (c/o). Kill City coat (c/o). Quay sunglasses (c/o). Shoe Cult by Nasty Gal shoes (c/o). This is probably one of my most comfortable outfits to date. This dress is classic and yet so romantic; it's perfect for anything from work to a date night. I instantly felt 10 times more feminine and sultry in it. I added the wool+lambskin coat and tiered spiked necklace to give it a little rock 'n' roll kick. 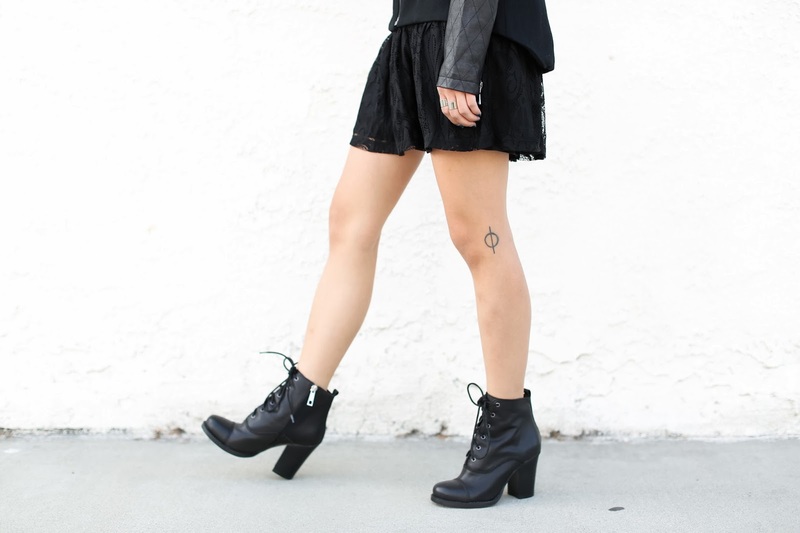 This whole outfit was planned around these understated and amazing genuine leather boots. I have worn them at least once a day since they arrived at my doorstep a week ago, and they've also been incorporated into all 3 of my Halloween outfits thus far. It's the perfect staple boot--not too tall or chunky to where more conservative brows would be raised, but enough height to satisfy a vertically-challenged girl, such as myself. I'm kind of a wimp at wearing heels with no platforms (really trying to change that), but I was amazed at how effortless walking in these shoes for a consecutive 12 whopping hours was. I wonder when I'll take them off. Estimate: Never. Loving this all black outfit! You look stunning! Perfect all black look, love it! Those shades are beyond amazing! Love the frames! Loving all your looks at the moment!